It was a gorgeous afternoon to work in the garden, but too hot a day to simmer beans on the stove. That is what crock pots are for. I tossed the dry beans, chopped greens, onions and seasonings into a the crock pot and walked away for a few hours. I must confess that black-eyed peas and greens is not an old standby meal for us, me from Ontario and Stealthy Dad from Wisconsin. One day I will find some Southerner to teach me how to make it authentically. For today, I went to what is familiar to me: garlic, coriander, cumin, and a touch of turmeric. 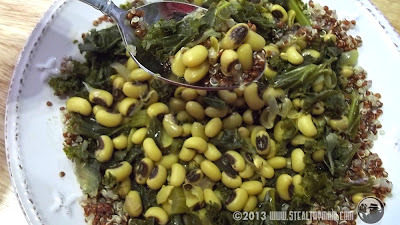 Those seasonings work for lentils, so why not black-eyed peas? Served over quinoa, it all came together well. Set the crock pot to "high", and find something else to do for four hours. If you are headed off to work for the day, set it on "low" and return home to a hot, fresh meal. Serve over quinoa or rice.